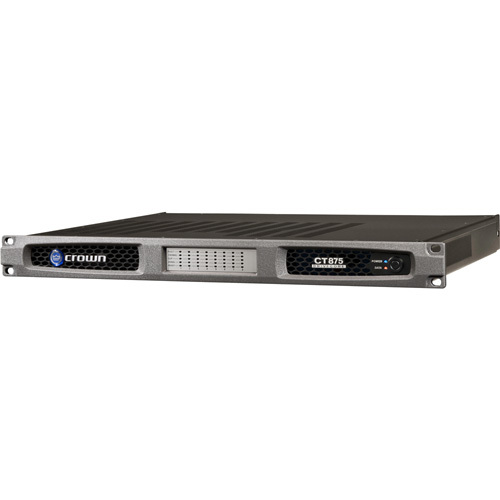 The CT875, part of the ComTech DriveCore series from Crown Audio, is an 8-channel power amplifier that offers professional audio quality in a slim design. The amplifier has a 1RU chassis, allowing you to install it in any standard equipment rack. It provides 75W per channel into 8 ohms for strong, clear audio with low distortion. DriveCore technology provides excellent efficiency of over 90% for a fantastic performance to power ratio. It does not require a cooling fan, providing silent operation. The amplifier offers flexible input routing, allowing you to send an input signal to any of the 4 outputs. Integrated Life-Safety features and patented feedback and protection circuitry protect the amplifier from damage to ensure a lifetime of reliable operation. A universal power supply lets you use the amplifier internationally, ideal for touring applications.